Sri Lanka’s literature is tri-lingual. Three languages add an abundant richness to home-grown book world. Unfortunately, very few of us have the ability to read in all three. Most Sinhalese cannot read Tamil and vice-a-versa. Many of us from both races read our literature in English and have limited knowledge of the books in our own mother tongues. I too am the same and of late have made a committed effort to read Sinhala writing; and I have found a hitherto unimagined and unexplored treasure trove. 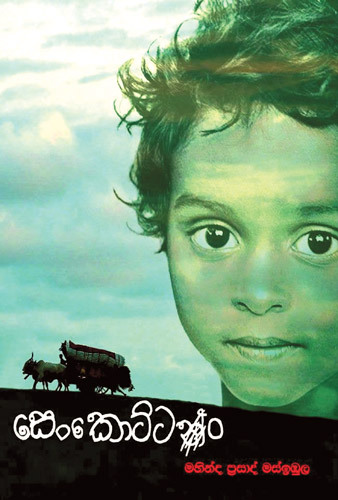 It is time we Sri Lankans went for cross-culture reading in literature. This would give a well-deserved encouragement to local authors scribing in their native tongues. Currently I write reviews of modern Sinhala books and I am making a sincere attempt to bring their worth to the English reading community. I have already worked with State Lit award winner Timran Keerthi and his ‘heart-string-pulling’ poetry in ‘Yannam Chandare’ and I have also reviewed Mohan Madawala’s ‘Lovina’ of the Mount Lavinia story. Both excellent works. And here now is ‘Senkottan’, a fabulous creation of literature by Mahinda Masimbula for which he won so many awards. If you have the ability to read Sinhalese, please find a copy and get going. It is only 300 rupees. The beginning of the story is beautiful. This is nineteen thirty-six. A bullock-cart drawn by a pair of tired bulls is making its way to Anuradhapura via an ancient road and is passing Pallebadde. Two holy men (Upasaka Mahaththuru) are on a sacred mission. The cart is filled with collected items of brassware that has been donated by the faithful. The men dressed in pure white have been crawling the long distance and stopping at many small hamlets for people to make their donations. Once the men reach their destination the collected brass would be given to the temple authorities. They would melt the metal and use it to make a serene tabernacle for the majestic Ruwanvalisaaya which was then undergoing renovations. This was a way of worship for the ordinary, the brassware they generously gifted would evoke blessings on them. The gesture was as ancient as their faith. There was an old man with a little boy in the gathering when the bullock-cart stopped at the village of Godakawela. The two ambled to listen to the Upasaka man ranting his ‘collect blessings’ story. Having heard the appeal some villagers contributed and some others went home to bring their snippets of brass to send to Anuradhapura. The old man carrying a bundle of clothes, Veerappuli Henaya, too wanted to gift what he had, a brass knife blade, to get some blessings, not for him, but for his grandson, the little boy who answered to the name of Baba Henaya. Author Masimbula writes this part very well. The offering of Veerappuli Henaya is not accepted. The old man and the little boy are from the ‘Dhobi clan’ (Rada caste). A holy venture of such purity of collecting and carting brassware to Anuradhapura for the Ruwanvalisaaya could not be soiled by the donation of someone from a lower caste. So begins ‘Senkottan’. The theme is a paradigm of abuse and the story weaves through the unfortunate people who are pigeon-holed by their caste to a lifetime of condemnation. The book bravely and boldly tells the sadness of ‘lesser beings’ and how they were marginalised and continuously suffered in society. The years have gone by and time has almost erased such incidents from our present day memory, or has it? There would be very little meaning in my picking pieces from ‘Senkottan’ to write in this review. It’s better you get gross value by reading the book. What I need to express in unconditional praise here is that Mahinda Masimbula has created an excellent narration which I think by any standard makes it a great read. Page 26 –advice from a withered old Dhobi woman to her daughter. “I am only telling you this is how we were born and what we have inherited. Why try to touch the sky? We are sinners by birth and paying for our sins, just remember that” says Malma Ridi, matriarch of the clan. My translation is quite dull, relative to the beautifully expressed Sinhala wording in the book. Masimbula to me is a local Chinua Achebe. He may not be invited to Columbia to give lectures, but he could be, if the world came to know of him. But that is the sad part. In the international literary world, Masimbula is no better than Veerappuli Henaya. The village Hampden or the mute inglorious Milton that Gray wrote about in his elegy. That being the unfairness of the literary world, let me say what I have to about the ‘Senkottan’ author. The writing is fresh from a free mind and it is well-planned and chronicled to tell the ‘Dhobi story’ without under-playing or over-expressing the calamities of caste divisions. When little Baba Henaya attended the village school it was his first traumatised taste of the un-equality that he has inherited as a birth right. Masimbula says it all in simple words that carry a world of meaning. His description of how the old man grandfather made his feeble attempt to explain to the innocent Dhobi boy the unfairness of life stretched into a lifetime is heart-breaking. That is where the author shines in his brilliance, his poignant phrasing of accepted norms which in any just mind will certainly not be acceptable. We do read and talk of slavery, apartheid and untouchables and their suffering of prejudices for being born on the losing side of the lottery of life. Yet we too, knowingly or unknowingly, look up and spit often times. ‘Senkottan’ is an eye opener. The uneducated village people making their living washing the dirt of their superiors was a way of life in the years gone by. These were the ‘Dhobi Clan,’ scarred by the caste they were born to. Washermen and washerwomen who carried their cloth bundles. At times they were invited to the homes too, it was to cleanse the maidens who had attained age. Beyond that, there was no place for them in the just and religious society we lived in. Times may have changed and the world has become older and wiser in some ways and more foolish than ever in most others. The Dhobi and his clan have almost vanished from the society where their place was always in the lower rung. Yet, it is important for us to remember that such terrible atrocities took place in the very society we live in. Maybe we should respect equality more and discard the superiority that we sometimes shout about as our own birth right. Mahinda Masimbula re-opened my eyes to a wrong that has plagued us in Sri Lanka for a long time. Most of it is now swept under the carpet. Veerappuli Henaya, Malma Ridi and Baba Henaya do not carry cloth bundles anymore and visit houses to carry on the cleaning business. Washing machines and laundromats have replaced them. The sorrowful stories of the ‘lesser people’ are not as blunt and brutal as they were in times gone by. But even today they are very much present, in shadow and in silence, in different forms and different divisions. The more said loud in condemnation would be the answer, as then, less people will prance on the prejudices that unnecessarily rot and ruin our society. ‘Senkottan’ made a wonderful contribution to tell a saturnine story of sadness. The book added a considerable measure to awaken my own rusted thoughts of fairness in the society we live in. Go buy the book, post it to me if you don’t like, I will send you the 300 rupees. That is a promise. By the way, I do not know who Masimbula is.